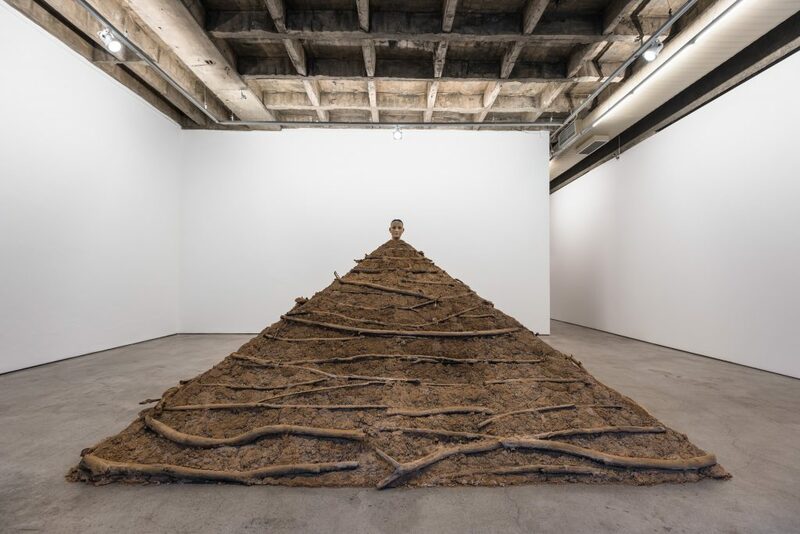 Galeria Luisa Strina is pleased to present Solo, Thiago Honório’s (Carmo do Paranaíba, 1979) first solo exhibition at the gallery. Honório presents his work Roca, a head of an 18th century imagem de roca (holy or religious statuette) mounted on a solid shape made from a Brazilian building material commonly used in the 18th and 19th century colonial period, known locally as pau a pique (similar to wattle and daub). This vernacular technique consists of a large lattice framework formed by vertical wooden slats or logs and horizontal bamboo beams, interwoven by vines and filled in with clay, resulting in a wall. This is one of the most recurrent of all the so-called earth architecture, especially in rural areas. The religious head, statue or imagem de roca designates the kind of processional holy statuettes which are dressed in clothing, wigs and adorned with precious and semi-precious stones or costume jewellery. The Portuguese word roca, as a feminine noun, means staff, pole or rod, with a bulge at the end around which cotton, linen or wool is wound: a reel (roca de fiar). It also means the large, elevated formation of stone, rock, boulder or cliff. According to Thiago Honório: “The ‘imagem de roca’ traditionally appears in processions and consists of a jointed wooden structure of which one can only see the head, hands or arms and, sometimes, the feet of the sculpted piece, wrapped in clothing and ornaments that characterize it according to its liturgical purposes. Many of these statuettes were built to a roughly life-size scale.” This kind of sculpture became considerably widespread in Brazil, especially in Bahia and Minas Gerais during the baroque period and until the mid-19th century. 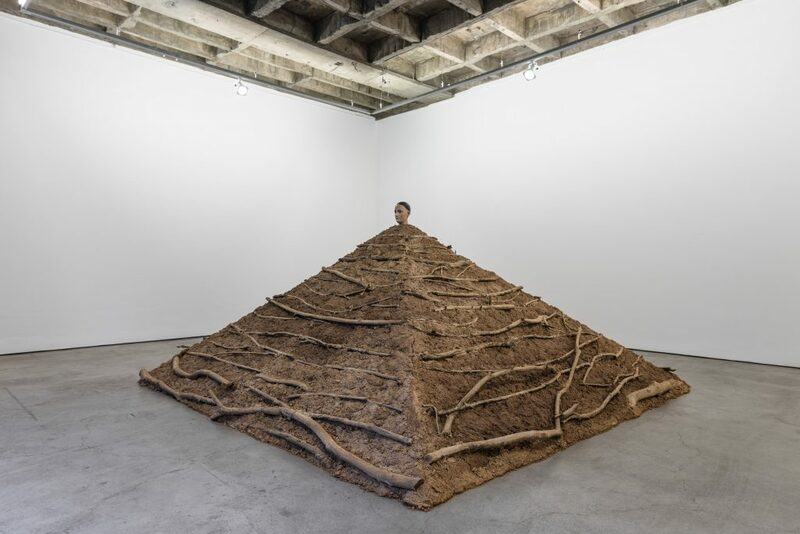 In the case of Roca, a work that stands alone in a large area of the exhibition room, the head of the statuette is found atop a geometric “mound” of pau a pique. 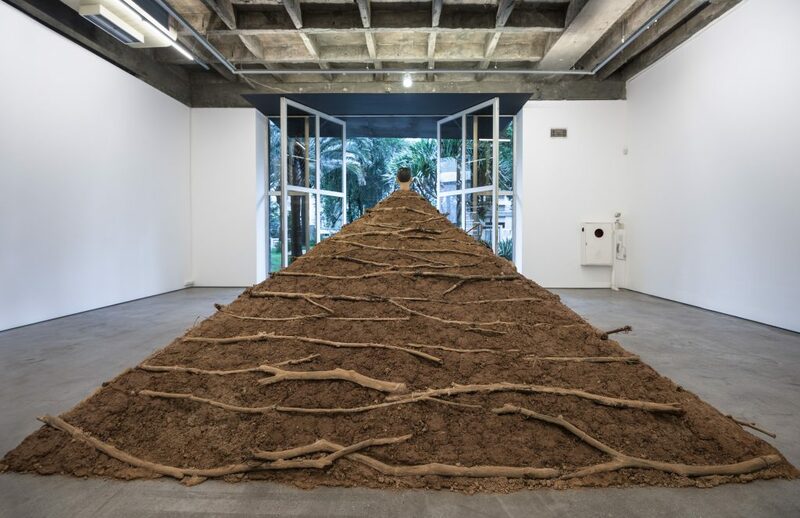 In the exhibition Solo, Roca is anchored to the earth, the ground; implying the dual meaning of the Portuguese word solo, which can translate equally as soil, land or ground and solo. 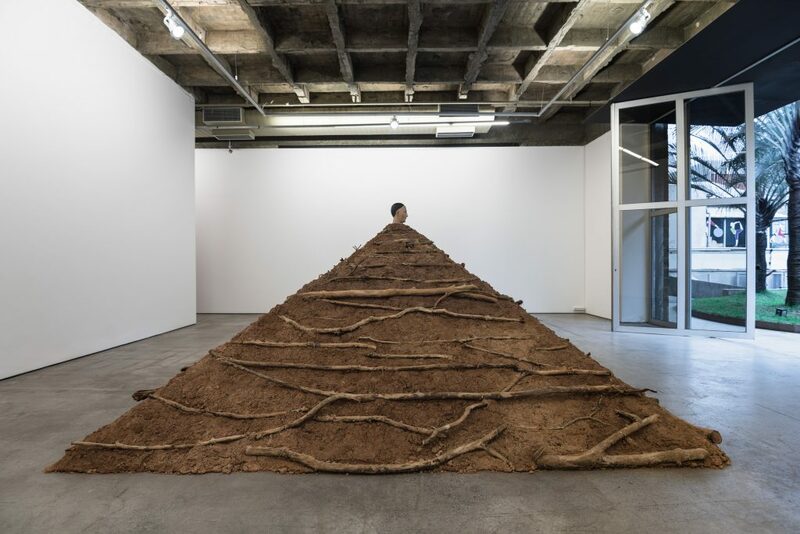 The work seeks to critically analyze, in a metalinguistic manner, the notions of solo, layers of earth, floor, the ground of a building or house, or the surface which is made for standing on; physical bedrock on which construction work is executed. In a figurative sense, it refers to nation, country or region: on Brazilian land, fertile land. The etymology of the Portuguese noun solo comes from the Latin sŏlum, which means bottom, foundation, pavement and sole of the foot. And also solo in the sense of alone; the idea of being executed by just one voice or instrument; from the Latin sōlus, one from the notion of only, solitary; and can also be dance, artistic gymnastics, musical piece, theatrical presentation, individual exhibition or section to be performed by a single artist. Thiago Honório ‘Solo’ Installation view at Galeria Luisa Strina, 2017. Courtesy Galeria Luisa Strina, photography Edouard Fraipont.